It’s time for another cozy, yummy comfort food that will make your tummy feel like it’s wrapped in a warm blanket of love and deliciousness! 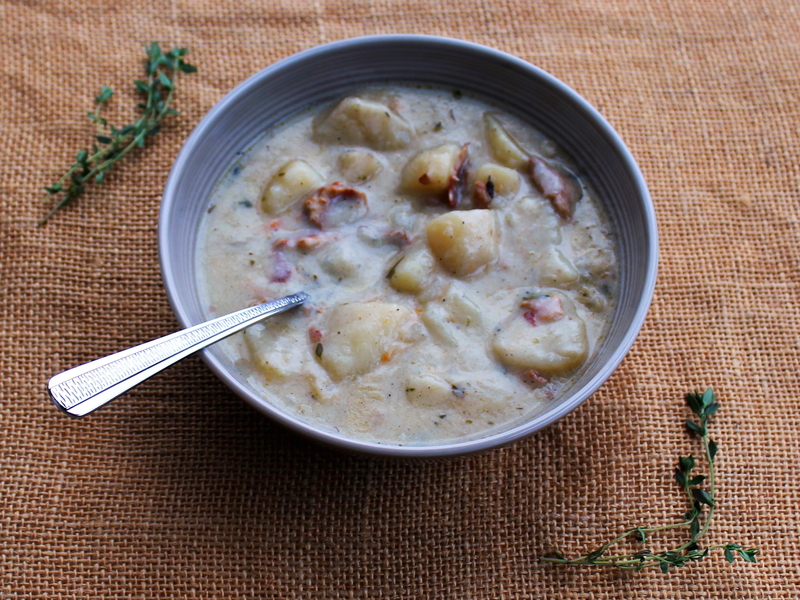 Say hello to Creamy Potato Soup with Bacon and Fresh Thyme! I’ll never turn down a bowl of hearty soup. It’s one of my favorite food categories ever, right up there with nachos, caprese salads, and anything containing unsweetened raw cacao. So even though the weather here in Metro-Detroit has been absolutely stunning the past week, with multiple blue-skied, sunny days, temperatures in the upper 50s and 60s(! ), and spring feels despite it being February, I’m still digging this filling, traditionally cold-weather soup. It’s hard not to with its rich cream base, savory bacon bits, plentiful potato chunks, and plethora of spices including fresh thyme, which is pretty much one of my favorite things right now on account of it’s so lovely. Basil, beware: thyme may surpass you as my new herb obsession! (I kid, basil; I heart you wayyyy too much). But seriously, every packet of fresh thyme I buy is worth the several dollars I pay for it. A little goes a long way in enlivening soups, salads, meats, fish, dips, homemade stock . . .. And it’d be even more cost effective to grow one’s own thyme in an outdoor or windowsill herb garden. Now there’s a thought! Note to self: add cultivate herb garden to my Spring Dreaming list! And now, on to the recipe and sweet, sweet eat-it-in-your-sweatpants-on-the-couch comfort food. Cook the bacon according to your desired method of preparation (mine is: preheat the oven to 400 degrees; line baking dishes with tin foil; lay strips of bacon out individually on tin foil; bake until crispy, about 20-25 minutes). Let cool, then blot off excess grease and tear/crumble into tiny pieces with your hands. To a large pot over medium heat, add the oil, onion, and garlic and let sauté until softened, about three to four minutes. Then add the potatoes, carrots, stock, bay leaves, and spices. Bring the soup to a boil, then reduce to a gently rolling simmer and let cook for 25 minutes. Toward the end of that duration, it’s time to make the creamy base for the soup. Melt the butter in a small saucepan over medium-low heat and whisk in the flour, forming a smooth, uniform paste. Then slowly and gradually pour the milk in – continuously stirring as you do so – until a thick, creamy, sauce-like consistency emerges. Remove from heat and immediately stir into the soup pot until well blended. And you’re done – your cozy, hearty meal awaits! Makes six to eight servings.